I love, love, love books and have raised all my children to love them also. 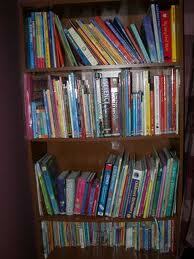 Since the beginning of my homeschool days I have stocked my book shelves with educational books for the children. Of course they have their own stock of books they like to read, but none are educational. Which is fine with me I don't mind supplying them. However, most of the books have sat beind deemed boring. Boring there are award winners on those shelves, Call it Courage and The Sign of the Beaver, just to name a few. There are also books on figures from history, poetry and science all deemed borrriiinnnggg!! Up until recently there have been two books on those shelves which have been used over and over agian. 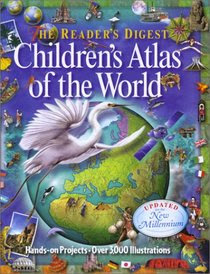 The dictionary and the Chidren's Atlas of the World which I first discovered at a local library. While it I feel it is too young for the boys, they love looking at the maps and seeing the images of the different things each country/state has to offer. Brett loves that he can easily find out quick facts by using the fact file in the back of the book. When I first started homeschooling I frequent a variety of message boards gleening all that I could. One book that was talked about a lot and which I purchased is Tom Brown's Field Guide to Nature Observation and Tracking. Brandon discovered the book about a year ago and learned a lot from it. The other night Brett wanted to go to bed early and asked Brandon if he had anything boring to read, Brandon handed him the book. As Brett was leaving the room Brandon made this comment, "But, it is not boring." Brett confessed he stayed up until 2:00 AM reading the boring book and shared with me yesterday all he had learned. Stock those shelves, you just never know what they will pick up. Oh and the other books were ones we had used for school and I saved, so I did not spend extra money. This post is linked to No Ordinary Blog Hop. I'm with ya...I love books too!